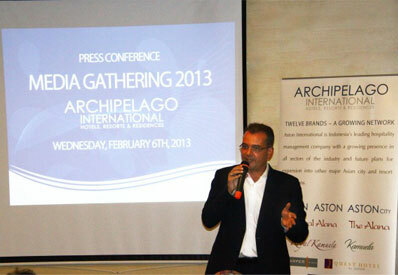 Jakarta, 6 February 2013 - Archipelago International, the hotel management company formerly known as Aston International, said it anticipates a solid year of openings and new hotel management agreements in 2013. Half of Archipelago new hotels in 2013 will be in the select service segment, the Jakarta, Indonesia based company noted, while 4 and 5 star hotels, which accounts for approximately 60% of Archipelago’s existing hotel rooms and over a third of Archipelago’s pipeline, will remain a high-priority market. New properties are expected to open in Bali, Balikpapan, Belitung, Bogor, Jakarta, Jambi, Jember, Kupang, Luwuk, Madiun, Mataram, Semarang, Solo and Surabaya, while Archipelagos Philippine joint venture, Filarchipelago Hospitality, will continue to expand its 5 star Crimson Hotels brand into the Philippines. Archipelago added that its new upscale lifestyle Alana brand will come to life with several openings such as in Seminyak, Bali and Surabaya helping to fuel the company’s growth. "After a record year in 2012 of openings, contract signings and amplified owner interest in development, we are entering 2013 well-positioned for continued footprint growth in both the budget and the upscale segments,” Norbert Vas, Archipelago’s Vice President of Sales & Marketing, said in a statement.